There have been a number of hui convened by the Runanga and negotiators over that past ten years that relates to the situation at Tauroa. They have been usually well attended with representation from all the Hapu associated with Tauroa making their opinions known. Tauroa has always been a site of significance for us and has been occupied by our forbears since the time of Kupe who named the reef Te Maara a Wharo, who was his sister. Later(early 1600s) the Tinana waka was damaged off Tauroa point and landed at Otia where the waka was worked on for two years before Tumoana sailed it back to Hawaiki. The nature of the environment at Tauroa has called to its people in the past and for many generations it has been used as a camping site for our communities. In 1877 Tauroa was sold removing its Maori land status and also any legal rights of occupation (under Pakeha law). However this did not deter our elders who have continued to occupy the coastal strip as a camping area and over the years building batches to stay in while they collected seaweed to sell. The council and subsequently DOC have come to accept the presence of these sites and buildings but have never agreed to giving them legal status and at a number of times over the years there have been calls to remove the batches because they have no ‘legal’ right and do not meet building code requirements. This has always been resisted by Te Rarawa people and organisations including Rūnanga o Te Rarawa. The position of the Runanga has been that this area is an ancient nohoanga of the Te Rarawa people and that it needs to be legally established as such to enable the effective kaitiakitanga of the area. In supporting the establishment the Roopu Kaitiaki for the Ahipara and Pukepoto areas the Rūnanga has taken its lead from that group who represent all the Hapu of Te Rarawa who affiliate to that area. This has resulted in our jointly establishing the Rahui (and its ongoing monitoring) and the replanting of twenty thousand juvenile paua late last year. In the direct negotiation process the Crowns first position was that any redress on the Tauroa Penninsular would require the removal of the existing batches which they described as a health risk because of their shanty type construction and because the water table is so high in that area that every long drop would go straight into the water and seep down into the kaimoana areas. DOC also identified ecological areas that were fragile and could not continue to take more people pressure. Of course this position was not accepted by negotiators and we need to find a way to continue to negotiate while preserving the position of the batch owners. Our greatest difficulty was the fact that there was no legal right of occupation and the area was owned by the Crown either as conservation areas or as a legalised paper road which was put in place in 1971. Inland the area is still owned by Pakeha who actively farm it right down to the edge of the paper road. The other issue for negotiators was that there have never been any private or whānau property rights in the area. It is a communal right for all. 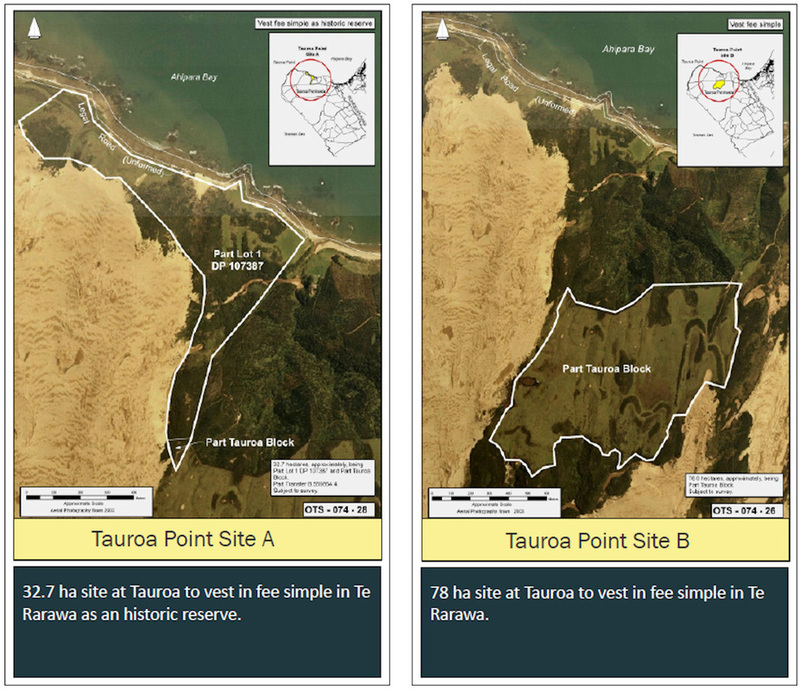 Even though people have constructed batches and such like over the years and have come to consider that these sites are their property, this is simply not the case and in effect every Te Rarawa member affiliated to Tauroa has the same right to occupy it. (notwithstanding the illegality of it under Pakehā law). During the course of our negotiations consultation hui there have been many submissions in relation to the batches and they have all expressed the view that they will stay as they are and if anybody was going to try to move them, then bring it on. Neither the Runanga or the claim negotiators have ever argued against this position. However we do recognise the ongoing impact that the permanent type dwellings have on the environment and in particular on the water table which flows into our kai gathering areas. While this is an issue we wish to explore further, it has always been with the involvement and participation of current residents as well as the wider hapū and iwi constituencies. In the course of negotiations we have argued the need to maintain our nohoanga and further enhance it as an iconic site of cultural and historical significance to Te Rarawa. At no time have negotiators been asked to protect any private interests at Tauroa, because there are none. Those families that have invested in constructing batches at Tauroa have done so knowing that their right of occupation has no legal tenure and that they are exercising an iwi and Hapu traditional right. Seeking redress over Tauroa has been made harder because the land was sold and has been under Pakehā law for nearly one hundred and fourty years. Secondly the Crown made it clear from the start that they would not consider the notion of legalising the batches because of their non compliance with building codes and because of their impact upon the coastal environment. Many of the existing batches sit on the paper road, and others sit on the strips of conservation land which surround it. In response to our insistence on keeping the Nohoanga ,the Crown offered a ten acre site a little more inland which could be used to create more permanent camping and batch sites creating certainty for anybody living there. It was suggested that if these sites were suitable batchowners on the coastal strip might consider shifting their permanent occupation to better locations. We accepted the ten acre site in order to preserve this option because you never know what the future may bring and we need to create opportunities for all Te Rarawa, not just the batchowners. In addition the site is an ancient area of occupation by our tupuna and is well suited to re-establishing our ahika there. But we have never agreed to forcing the shift of current batchowners. We continued to force the Nohoanga issue on the coastal strip and eventually the Crown agreed that land should remain available for iwi as camping reserves but not as sites for the building of batches. Without detracting from the presence of the existing batches we agreed to accept Crown lands along the coastal strip as a Nohoanga for the purpose of a camping reserve. However we struck a problem with the Paper road which is legally owned by the District Council and who would not relinquish ownership or management of it to the iwi. After several goes at it, it became clear they were not going to budge and because they were a local body exempted from the claim the Crown had no power to force them to comply. At that point we could have used some direct action leverage to force the issue but the batch owners were not engaged with negotiators and had not accepted that this was the way to address these issues. That was very unfortunate because it was a chance we didn’t take to work as one, and the result was our failure to acquire the paper road as part of the proposed redress. What we did get was the conservation areas which sit astride the paper road and the agreement to the Nohoanga. 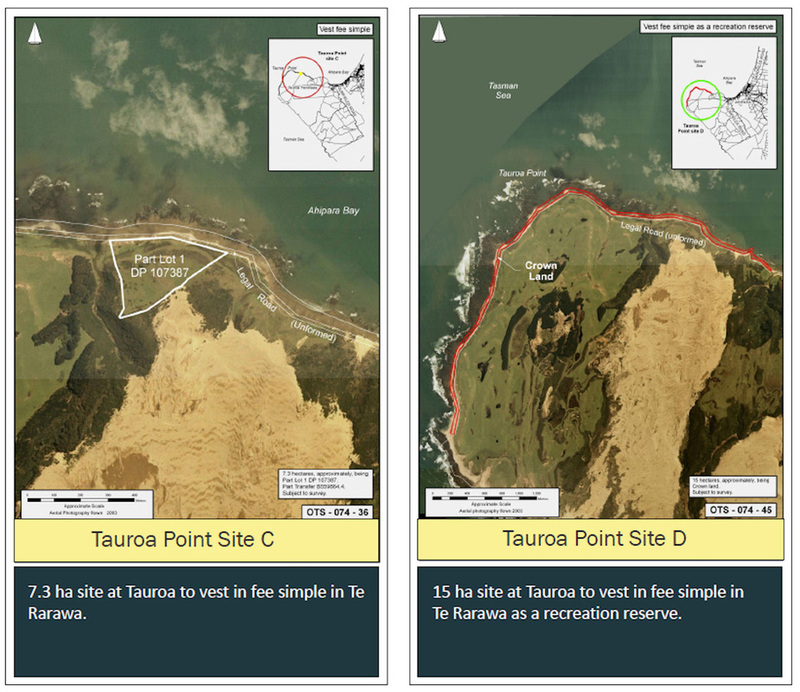 This is in addition to the ten acre site set aside for Papakainga and a further three hundred acres which includes all the foreshore lands from Waimaru stream around to Tauroa (which meets up with the Nohoanga) and a large area (about 170 acres) above the Waimaru Paa site which will provide direct access to the Tanutanu beach. Over and above all that we have in place the Korowai mo Te Taiao which provides for our shared management of the remaining Conservation lands across the entire peninsular and the Gumfields. This enables full authority over waahi tapu and cultural harvest of Taonga as well as an equall input into conservation planning. With these areas and with these tools we have the ability to re-establish the authority of our mana over these areas in both Pakeha law and Maori lore. While it is true that we have failed to secure the paper road in this negotiation, all is not lost. The council has indicated to negotiators that it is willing to continue talking outside of the negotiations to resolve the issue. The challenge now is for us to pick up the redress being offered while retaining our ability to go further. Through planning, organising and empowering our people to maintain our ahikaa at Tauroa we will further validate our intention to either have the paper road vested in us, or cancelled and the land returned to us in title. This is an ongoing battle, and Treaty settlements are not the end of things, they are really the beginning point of a new approach where we can regain our strength as tangata whenua upon a platform of rights and obligations that can be secured through this settlement. As to the question of private rights at Tauroa, that is not one for negotiators. It will be up to the iwi and the Hapu associated with Tauroa to decide on how we approach the question of privatisation but in all the hui we have held in relation to Tauroa private property rights has never once been mentioned. The secret to our success lies in our ability to work as one, this is already occurring with the Kaitiaki Komiti (of which I am an elected member) but it now needs all interested parties to work together to build the sort of pressure we need to put on council to get rid of that blinkin paper road. Of course the first and most important action is that nobody should move anywhere, and be aware that the negotiation process is only one small piece of the puzzle, our mana and our Tino rangatiratanga goes far beyond that, a journey that can only be achieved together.